Visitors to Kingman Estates Winery are in the middle of the action. Although most tasting rooms are separate from the winery itself, owners Doug and Karen Kingman wanted their place to be different. While sampling wine in their tasting room, a guy driving a forklift may pass through. Or during “crush” time, a large hose may be pumping grapes from crates in the parking lot, through the tasting room, into the winery. “When you’re there, you’re kind of part of the operation, even when you’re drinking,” says Doug Kingman. Doug Kingman watches as his brother in law, Mike Finnin, pulls grapes into the destemming machine. Wine is a passion for the Park Hill residents who love drinking it, talking about it and being around other people who enjoy it. But mostly, the couple wanted to have a business of their own, something Kingman says “we can enjoy as long as we want to do it!” Five years in, the Kingmans are hoping to turn the winery into their fulltime business within a couple of years. Until then, they are keeping their day jobs with Doug in IT project management and Karen in human resources, working at the winery evenings and weekends while maintaining a small staff. The winery got its start with a wine kit Doug tried that yielded decent results. It was inspiration enough that the couple purchased property between Palisade and Grand Junction, with the vision of growing grapes and making wine. They commuted from their home in Denver every weekend over the course of a year. Despite extensive testing and work on an irrigation system, it was determined that the land wasn’t going to be grow grapes successfully. In the meantime, the Kingmans developed relationships with other Western Slope vineyards and wineries, not only learning a lot in the process but also purchasing enough grapes to turn out 400 cases of wine in their first year in the garage on their property. Kingman estates winery has become the eighth largest in the state and produces 16 varieties. Giving up the property was a painful decision but the long commute wasn’t sustainable. “If it wasn’t going to grow grapes, it just didn’t make sense,” says Kingman. Instead, the couple opened a winery in an industrial area north of downtown Denver, just 15 minutes from their home, purchasing grapes from some of the vineyards and wineries they had come to know. Except for zinfandel grapes, which Colorado doesn’t grow, all of the grapes used in Kingman Estates Winery’s wines are from Colorado, which is one of the things that sets the winery apart. Because Colorado grapes are much more expensive than California grapes, they aren’t used as often. In addition, Kingman explains that, instead of purchasing grapes, many wineries use juice produced from all over the world to then make their wine. “You can buy 200–300 gallons of juice and ferment it, operating more like a brewery than a winery,” he says. “Wineries really have one shot to get grapes in and that’s when we process them, so we have a huge infrastructure with thousands of gallons of storage, tanks and large equipment to process all that.” Every part of the wine-making process is done at their winery, except growing the grapes. Although they could pass along those extra costs to consumers, the couple is determined to keep their prices lower, starting at $16 per bottle. “We want people to understand and know there are great Colorado wines so if people say ‘that’s reasonable,’ they’ll buy them and taste them and it will help the whole wine industry in Colorado,” says Kingman. Their efforts are paying off. The winery has become the eighth largest in the state and produces 16 varieties including reds, whites and blends. In July, Kingman wines won two gold medals, two silver and one bronze at the Third Annual Governor’s Cup Colorado Wine Competition. 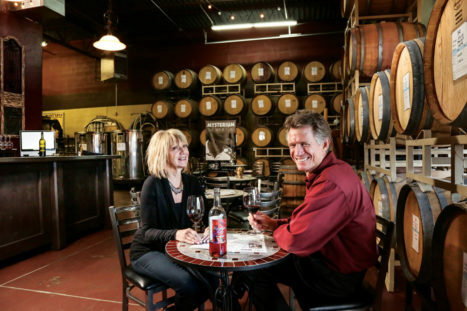 Doug and Karen Kingman enjoy the fruits of their labors—a glass of wine at their winery. In addition to their commitment to using Colorado grapes, there are other elements of Kingman Estates Winery that make them unique. In most tasting rooms, guests stand at the bar, getting their tastings. At Kingman, guests can also have a seat at small bistro tables, being served their samples. “We think wine is something where you should be relaxed and not in a hurry so you can enjoy it and enjoy your friends,” says Kingman. They also use volunteers who anxiously sign up to help at various times throughout the year crushing grapes, bottling and labelling. “It gives people an opportunity to be part of the business,” says Kingman. People can also join their wine club to get special pricing on bottles, exclusive vintages, free tastings and access to wine dinners, a harvest festival and other special events. Despite the romance of living on a vineyard, the Kingmans are really happy with the way things turned out. “We really like the whole winery environment and just wanted to be part of that,” says Kingman. “We’re making great friends in the area we live in,” Kingman says. “It’s all good.” To learn more, visit www.kingmanwine.com.